Hong Kong has 18,143 (at the end of 2018) licensed taxis, providing a personalised point-to-point public transport service. URBAN (RED) TAXIS are available throughout Hong Kong including the airport and Disneyland (except for roads on the south side of Lantau Island and Tung Chung Road on Lantau which is open only to authorised vehicles). Taxis are currently not allowed to operate to Discovery Bay* but previous restrictions on taxi access to Ma Wan were lifted on 14th December 2012 and urban taxis are now allowed access Ma Wan 24 hours a day. * with effect from 26th October 2014 urban (and Lantau) taxis are allowed access to Discovery Bay North only, in the vicinity of Auberge Hotel, DB North Plaza and Yi Pak. The Discovery Bay Tunnel fee is waived for taxis. Taxis are not allowed access to other areas of Discovery Bay. There were 15,234 licensed urban taxis at the end of 2018. There were 2,834 licensed New Territories taxis at the end of 2018. LANTAU ISLAND (BLUE) TAXIS are available on Lantau Island including Hong Kong International Airport and Disneyland but not Discovery Bay except Discovery Bay North*. *With effect from 26th October 2014 Lantau (and urban) taxis are allowed access to Discovery Bay North only, in the vicinity of Auberge Hotel, DB North Plaza and Yi Pak. Taxis are not allowed access to other areas of Discovery Bay. The Discovery Bay Tunnel toll fee is waived for taxis. There were 75 licensed Lantau taxis at the end of 2018. 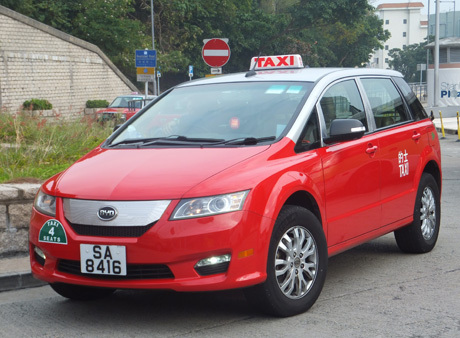 The number of Lantau taxis had previously been restricted to 50 until the government invited tenders for an additional 25 Lantau taxis in December 2015. The colour coding system for taxis was introduced by the Transport Department in the 1970's in order to distinguish legitimate taxis from illegal taxis. The colour scheme of red for the lower half and silver for the upper half of urban taxis was unveiled in September 1974. After the Cross-Harbour Tunnel opened in October 1974, distinct separate colour schemes for Hong Kong Island and Kowloon taxis were proposed as it had become apparent that some taxi drivers on Hong Kong Island were unfamiliar with roads in Kowloon and vice-versa but these plans were rejected. However, although able to operate in the New Territories drivers tended to congregate in Kowloon where demand was higher and illegal taxis continued to operate. 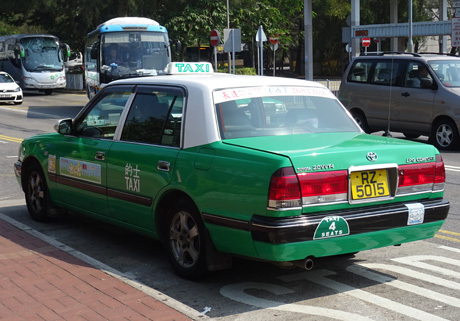 In June 1976 a New Territories taxi service was introduced with a green and silver colour scheme. 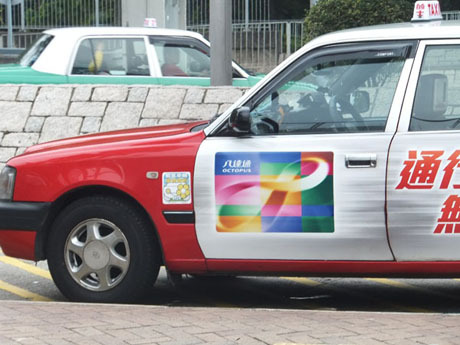 Urban (red and silver) taxis were allowed to continue to operate into the New Territories in order to prevent a situation where taxis had to change taxis at the boundary but New Territories taxis are not allowed to operate in urban areas. 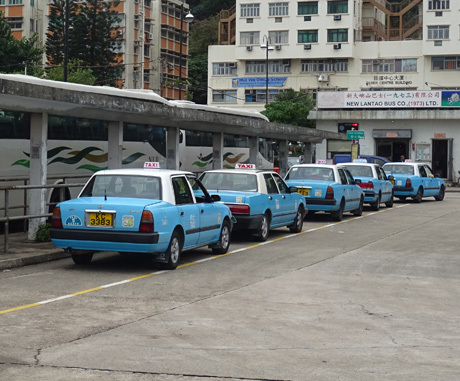 The colour coding of taxi operating areas continued when the 20 first blue/silver taxis serving Lantau Island were introduced in 1983. 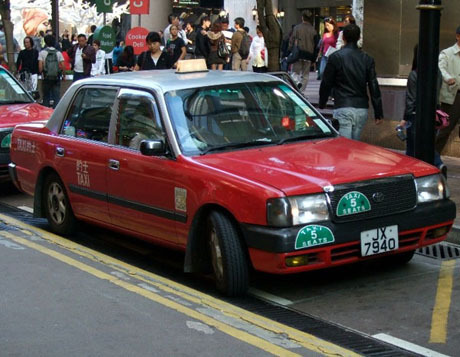 During the 1980's and early 1990's there was a large increase in demand for taxis as Hong Kong's growing prosperity made them more affordable but the subsequent increase in road space occupied by taxis made them a major cause of congestion and in 1994 the government decided to stop issuing new licences in order to constrain supply. Since 1994 no new licences were issued until mid-2016 when 25 new licences were awarded for blue Lantau taxis. In comparison to most other major cities, fares are modest and did not increase between 1998 and 2007. However, in February 2008 a modest one HK dollar rise in flagfall for Urban and New Territories taxis was applied. Following a review of taxi fares and applications for increases from taxi operators associations the government approved further fare adjustments for urban and Lantau taxis which took effect on 30th November 2008 and a new fare structure for New Territories taxis took effect on 16th January 2009. Further increases took effect on 10th July 2011 when the flagfall for all taxi fares increased by HK$2 to HK$20 for urban taxis, HK$16.5 for New Territories taxis and HK$15 for Lantau taxis. Owing to continuing rising fuel and maintenance costs, proposals for further increases were approved and took effect on 8th December 2013 when the flagfall for the first 2km of each journey increased by a further HK$2 to HK$22 for urban taxis, HK$18.5 for New Territories taxis and HK$17 for Lantau taxis. Additionally, the first stage incremental charge for each 200-metres after the flagfall to was increased by ten cents to HK$1.6 red taxi (journeys 2-9km), HK$1.4 green taxi (journeys 2-8km) and HK$1.4 blue taxi (journeys 2-20km). The surcharge for green taxis for each piece of baggage, animal or bird, and telephone booking, was increased by HK$1 to HK$5, bringing it in line with red and blue taxis. In February 2017 taxi fare increases were approved which took effect from 9th April 2017, The flagfall charge for the first 2km of any journey increased by HK$2 and the first-tier and second-tier incremental charges in respect of each subsequent 200-metres travelled increased by HK$0.1 and HK$0.2 respectively. Charges for waiting time after the initial flagfall increased in line with the incremental first-tier and second-tier charges and the luggage charge per piece (except light luggage carried inside the passenger compartment) increased by HK$1. The government has estimated that the average increase is 9.98% for Urban taxis, 11.5% for New Territories taxis and 8.6% for Lantau taxis. The increases are less than requested by the taxi trade in its application In late 2016 when representatives applied for an increase in flagfall of HK$2 to HK$24 for the first 2km of each journey for urban taxis, a HK$2.5 increase in flagfall to HK$21 for New Territories taxis and HK$4 increase to HK$21 for Lantau taxis plus an increase in the charge for every 200-metres after the first 2km of 20 cents to HK$1.8 for urban taxis and HK$1.6 for New Territories and Lantau taxis. Additionally a reduction in the threshold for waiting time increments from 60 seconds to 45 seconds was sought. In September 2018 the Transport Department confirmed it had received an application for a fare increase for urban taxis, believed to be an increase in flagfall from HK$24 to HK$30 and an increase in the incremental rate for every 20-metres thereafter from HK$1.6 to HK$1.9. Applications for fare increases for New Territories and Lantau taxis are expected to follow. If approved, the increases would be likely to take effect in 2020. Fare discounting is illegal and is punishable by a maximum fine of HK$10,000 or six months imprisonment although it reality is difficult to control. There have been proposals from the taxi trade to introduce a fuel surcharge mechanism and in June 2013 the Transport Department confirmed it was undertaking a 14-month study into how fuel surcharges worked overseas. However, the department subsequently rejected the proposal for fuel surcharges in July 2015. At mid-2016 approximately 1 million journeys per day were being made by taxi, down by about 300,000 during the last decade. There are about 40,000 full-time drivers and taxis are licensed and regulated by the Transport Department and operated by taxi companies, owners associations and independent owner operators. Taxi licences can change hands for up HK$7 million. The majority (approx 70%) are operated by individual rentee-drivers who typically rent for about HK$400 a shift with two shifts a day. There are 220,440 people with valid taxi driving licenses in Hong Kong although only a small proportion are active in the trade. Taxis are licensed to carry either four or five passengers although since August 2008 all new Toyota Crown Comfort taxis delivered to Hong Kong are four-seaters since the vehicle has had to be modified to comply with Japanese exhaust emission standards and the five-seat version is no longer manufactured. The four door model is the same size and shape as the five door model it replaced but, owing to reconfiguration of the transmission and exhaust pipe, the gear shift lever has been moved from the steering column to the cabin floor and the three-person bench type front seat has been replaced by two independent seats for driver and passenger. 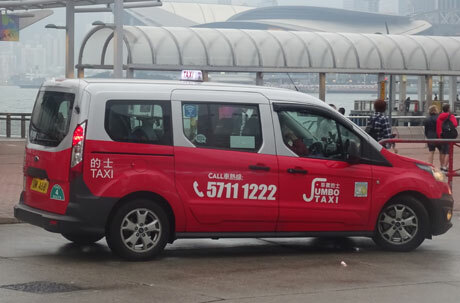 By mid-2016 there were about 7,500 four-seat taxis in the fleet and it is expected that the five-seater taxi will disappear from Hong Kong's streets by 2020. Only 3% of journeys carry five passengers and the change from five-seat to four-seat taxis is not expected to have any significant effect on taxi services. Children under 3 years of age are not counted as a passenger and three children age 3 or over but under 1.3-metres in height are counted as two passengers. However, two children over 3 years of age but under 1.3-metres height are counted as two passengers. In October 2016, Inchcape, the supplier of the Toyota Comfort taxi to Hong Kong, announced that production of the current model will cease in the fourth quarter of 2017. A new hybrid Toyota Comfort vehicle was introduced in January 2019 with about 1,000 expected to be in service before the end of the year. The LPG/electric hybrid model has a capacity of 4 passengers is equipped with an electric sliding door for wheelchair access. The new taxi costs about HK$320,000, about HK$60,000 more than the old model but can achieve a fuel consumption of 19.4km compared to 9km per litre for the old model. Taxis are comfortable and have plenty of boot space for luggage, usually being able to carry at least three regular size suitcases. All taxis are fitted with seat belts and it is mandatory for both driver and passengers to wear these. During 2010 there were 1409 prosecutions of taxi drivers or passengers for failure to wear seat belts. Smoking is not allowed in taxis. Taxis can also be booked by telephone for which a HK$5 surcharge applies. Between 2001 and 2004 about 99% of taxis were converted from diesel and now operate on cleaner LPG fuel. Wheelchair accessible taxis are operated by Diamond Cabs and Chung Shing Taxi Co. Diamond Cabs, which operates as a social enterprise, operates seven Toyota Noah Welcabs which are designed for wheelchair access with a mechanical ramp at the rear. These cabs must be pre-booked. 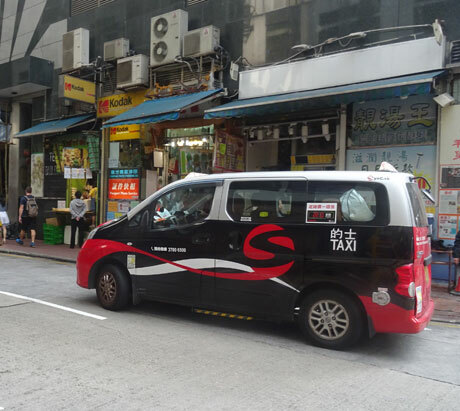 A further 200 Nissan SynCab taxis, operated by Chung Shing Taxi, capable of carrying passengers in wheelchairs are eventually expected to be in service. 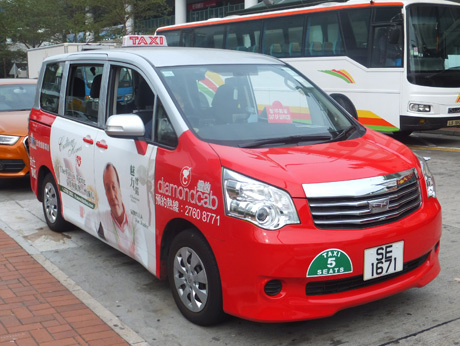 The first 20 (15 red urban taxis and 5 green New Territories taxis) were commissioned in February 2015 and by April 2017 the company had about 140 SynCabs in service. The SynCab taxis have four seats, a large trunk with capacity for up to eight large bags and are equipped with wi-fi and USB ports.The taxis must also be pre-booked either by phone or SynCab mobile app. Normal rate per km applies but there is a HK$60 booking fee. Cash or credit card can be used for fare payment. PrimeCab Hong Kong also operates more than ten larger capacity Ford Transit Connect taxis. In December 2016 Jumbo Taxis, a partnership between Future Motors and taxi operator Chow Kwok-Keung, was launched with a fleet of 40 Ford Connect Transit vehicles, capable of holding up to nine pieces of luggage, and equipped with free Wi-Fi and a mobile phone charging service for passengers. The taxis are also equipped with devices to monitor driving habits and deter drivers from taking longer routes. The Jumbo fleet had expanded to 70 taxis by April 2017. Taxis can be hailed on the road but a booking fee of HK$50 applies for bookings via a hotline. The company is targeting corporate clients and business passengers and will not offer wheelchair access. Most drivers speak or understand at least a little English and will be able to get visitors to hotels, public transport locations and popular tourist attractions without any problem but to avoid any confusion it is often advisable to have your destination written in Chinese or a map to point to. 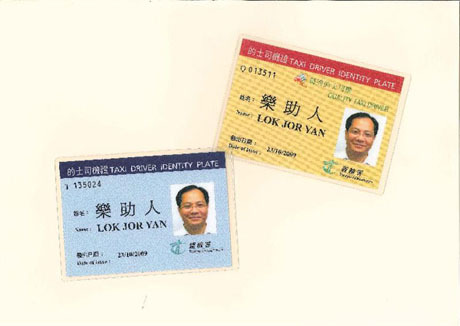 In November 2007 the Hong Kong Tourism Board took the initiative of issuing all taxi drivers with a bilingual translation booklet in English and Chinese detailing names and addresses of hotels, landmarks and tourist attractions with the intention that drivers allow passengers to scan the booklet to help establish their correct destination and avoid any confusion. Taxi drivers are not obliged to change HK$500 or HK$1000 notes. 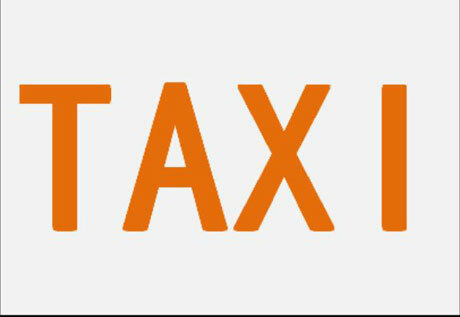 All taxi drivers are required to display a taxi driver identity plate. 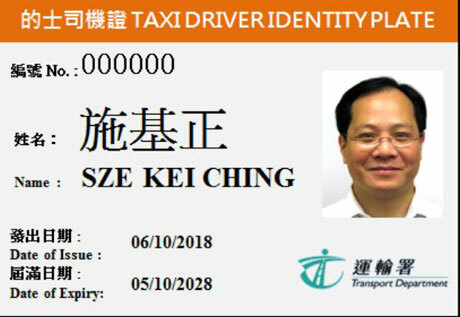 In October 2018 a new taxi driver identity plate was introduced with a validity period of ten years to replace the previous plate which was only valid for one year. The new plate is being rolled out following requests from taxi and Public Light Bus trades for a longer validity period of driver identity plates, and as one of the facilitation measures put forth in the report of the Public Transport Strategy Study released in June 2017. Existing one-year plates will continue to be valid until their expiry date. In June 2015 a government review to establish whether the existing taxi supply can meet demand made a preliminary assessment that the number of licenced Lantau taxis should be increased by 25 to 75* but that the existing supply of urban and New Territories is adequate. In addition, the Government is to review the role and positioning of taxis under the Role and Positioning Review (RPR) of the Public Transport Strategy Study. It was expected that the entire RPR wouldl commence in mid-2015 and be completed in 2017. * Tenders for an additional 25 Lantau taxi licences were invited in December 2015 with a deadline of 11th January 2016. These additional Lantau taxis began service during the second quarter of 2016. There are also at least 230 designated taxi pick up / drop off points and 46 drop off points. Taxis can be hailed in the street. When a taxi is for hire this is indicated by a red “For Hire” visible through the windscreen and at night a red illuminated “Taxi” sign on the roof of the cab. In 2003 the Transport Department introduced a scheme for relaxation of no stopping restrictions (NSR) on roads with a speed limit of less than 70km per hour for taxis picking up and setting down passengers, meaning that taxis can now pick up and drop off almost anywhere, provided they do not cause an obstruction. However, taxis are not allowed to wait for passengers on roads with NSR. The scheme, under which taxi owners/drivers must apply for a permit for exemption from picking up or setting down on roads with NSR, is reviewed annually with the latest exemption expiring on 31st January 2019. However, in line with recommendations in the Public Transport Strategy Study published in June 2017, starting from 28th December 2018 works will progressively be carried out to permanently relax the restrictions on taxis for picking up or setting down passengers in all designated restricted zones on roads with speed limit at 70 kilometres per hour or below. Supplementary traffic signs displaying "except taxi pick up or drop off" beneath traffic signs with a no-stopping restriction will progressively be erected in restricted zones across the territory. This will spare the taxi trade the need to renew restricted zone permits annually. The works are expected to be completed by 2021. Before the completion of the works, restricted zone permits will continue to be issued to the taxi trade at the end of January each year. Taxi drivers have been reminded to continue to exercise self-discipline and to strictly observe the "pick up, drop-off and go" and "no waiting" rules. In the event of violations of the rules causing obstruction to other road users, the Government may consider implementing traffic control measures, including restoring the no-stopping restrictions for taxis at certain road sections. Taxis are usually in plentiful supply day and night in urban areas and at public transport interchanges and can usually easily be hailed in the street or by a hotel concierge. In rural areas of the New Territories and on Lantau Island taxis are a little more scarce. Several taxi operators provide a telephone booking service and details can be found below. 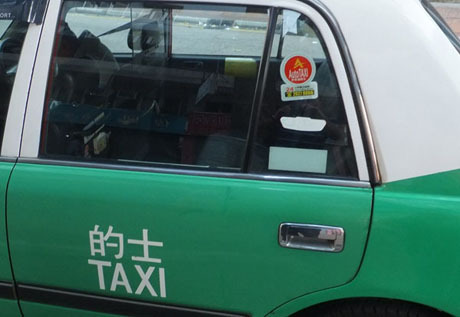 The vast majority of taxis are Crown Comfort, made by Toyota, who until recently enjoyed a monopoly on supply of Hong Kong taxis through local Toyota agent Crown Motors. However, following discussions with the Hong Kong Government regarding conversion of taxis to electric-powered vehicles, Chinese car maker BYD, agreed to pay HK$13.5 million to cover the construction costs of 45 quick-charging points in 15 public car parks, and another HK$9 million in provisional subsidies to help taxi operators buy 45 of its e6 electric vehicle models. Subsequently, the Hong Kong Taxi and Public Light Bus Association agreed to rent 45 e6 models from BYD at a total monthly rent of HK$360,000. A six-month trial of the first ten 4-passenger BYD electric taxis began in May 2013 but was suspended the next month when one of the charging units overheated and all other charging points were closed as a precaution. The trial subsequently resumed and all 45 BYD taxis were put into in service but by mid-2015 the number had reduced to 35. At the beginning of the trial there were only 17 BYD charging points ready for use, with BYD taxis being unable to use the existing 10 quick charging points and 1000 slow charging points around the city as these are only compatible with Japanese built taxis. Over 80% of the existing charging points are common 13A domestic type chargers which can take over 10 hours to fully charge an electric car. The BYD electric taxis have much less boot space for luggage storage than the existing Toyota taxi fleet. BYD had predicted that 3,000 electric taxis would be in service by the end of 2015 but in November of that year BYD admitted the trial had been a failure with no more electric taxis having been added to the fleet. 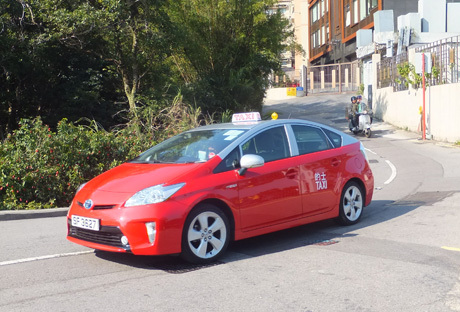 Crown Motors, the sole distributor for Hong Kong's main taxi supplier, Toyota, received orders for 20 Prius hybrid taxis in late 2012, which were introduced into service during 2013. Although Toyota had previously said that its hybrid cars were not intended for commercial use, the Prius has already been succesfully operating in taxi fleets in many major cities including Sydney, Paris, Toronto and Tokyo. In March 2013, the government's Environmental Protection Department approved applications from six companies for funding from its Pilot Green Transport Fund for trials of nine Toyota wheelchair accessible electric taxis, some of which were in service by early 2014. Other manufacturers are also making efforts to break into the Hong Kong taxi market. Nissan, which in 2012, relocated the global headquarters of its luxury car division, Infiniti, from Japan to Hong Kong, and which was once the dominant supplier of taxis to Hong Kong before Toyota offered cheaper repair costs, confirmed in September 2012, it was in discussions to introduce 50 Nissan Leafs for trial, followed by a larger trial of 100 of its next generation eNV200 model electric car. In July 2012, the Environmental Protection Department had approved an amount of HK$11 million from the Green Transport Fund to import five electric taxis and two electric buses from Fiat for a two-year trial in the New Territories. Each taxi costs about HK$1.28 million, over five times the HK$240,000 cost of a traditional cab. In Italy the cabs travel about 200 kilometres before recharging but it is hoped the capacity can be increased to 280 kilometres in Hong Kong. The taxis take about 45 minutes to charge. However, in May 2017 the Environment Bureau acknowledged the failure of a 2-year trial of electric taxis since the long charging time makes the vehicles unsuitable for operating round the clock. Three electric e6 taxis made by Chinese manufacturer BYD used in the trials have been re-registered as private cars. 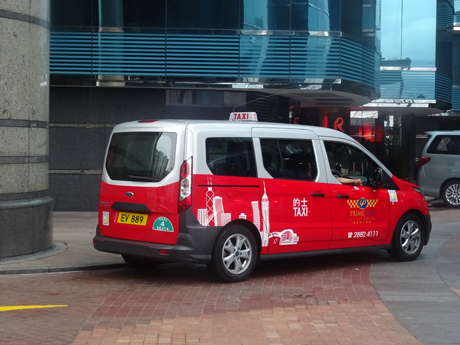 Ford Motor Company, which has opened a dealership in the city with Inchcape Far East Company, launched an upgraded taxi version of its Transit Connect LPG powered car in Hong Kong in February 2015. The taxi costs about HK$250,000, about HK$30,000 more than the Toyota Crown Comfort , but the vehicle which has four seats has sliding doors and a more spacious interior and headroom, with a luggage capacity of 1,656 litres, about three times more than the Toyota Crown Comfort. 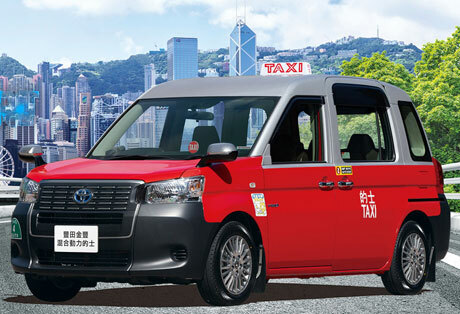 The model is expected to be more attractive to taxi operators who do airport runs owing to its large luggage capacity and by early 2017 PrimeCab Hong Kong was operating about 20 Ford Connect taxis. Chinese car manufacturer Geely Automobile, who produce the London cab, have designed a modified LPG fuelled cab with wheelchair access, suitable for the roads of Hong Kong and was believed to be planning talks with local taxi operators. In November 2017 four Hybrid LPG and electric powered new generation Toyota Crown Comfort taxis were delivered to Crown Motors, the sole distributor of Toyota taxis in Hong Kong. The taxis, costing HK$300,000 each, are expected to achieve a running cost of about half that of traditional LPG taxis, with a travelling distance of about 19.4km per litre`compared to 9km per litre. The taxis have a four passenger capacity and an electric rear sliding door to allow wheelchair access. The taxis are to undergo safety and compliance tests by government departments and are expected to be introduced into service in 2018 following which production of existing models of Crown Comfort taxis will cease. Toyota’s market share of Hong Kong taxis exceeds 90% and over 10,000 existing Crown Comfort models are over 13 years old and due for replacement. In June 2011, following a six-month trial involving 240 taxis, Autotoll, Dah Sing Bank and Visa launched the "autoTAXI" system whereby users of Visa credit cards and Visa payWave cards are able to pay taxi fares by credit card. At launch date the system, which cost HK$10,000 was installed in about 100 taxis and had been fitted to about 600 taxis by the end of 2011. Users of Visa payWave cards were able to swipe the card against a reader, whilst users of Visa credit cards could insert the card in the machine to be processed. No signature was required for less than HK$500. "autoTAXI" system taxis were identified by a "white wings" symbol and were nicknamed "flying taxis". However, the autoTAXI service ceased operation on 10th September 2012. In January 2017 SynCab announced it was operating a pilot scheme during a two week period which would allow its 32 premium taxis to accept credit card payment and offer free Wifi and mobile charging in its cabs. Taxis installed with "autoTAXI" system accepting Visa cards displayed "autoTAXI" logo and "white wings" on rear door quarter glass before the service was discontinued in September 2012. During late 2017 e-payment platforms had entered the Hong Kong taxi market with about 1,500 taxis signing up with Alipay and 1,000 taxis having signed up for WeChat Pay transactions. WeChat Pay was aiming to secure half the market within three to six months. In October 2011 a free "app" for smartphones, "TaxiShare" was launched, which is intended to help people share taxis by finding other passengers who wish to travel in the same direction. The app uses GPS to display passengers location and connect with others within a 250-metre radius via a chatroom. The app is available for iPhone and Android users. Another app “Taxiwise”, developed at Hong Kong Science Park by a group of American, French and local IT professionals and aimed at people unable to speak Cantonese was launched in December 2013. The app translates destinations into Cantonese before matching the customer with a cab and has a target of having 1,000 drivers by mid-2014. Luxury taxi service Uber launched in Hong Kong in July 2014 and launched UberVan in January 2015 but has experienced regulatory problems and in August 2015 five Uber drivers were arrested for operating a hire car without a permit (the number of hire car permits in Hong Kong is limited to 1,500) and insurance and two office interns were taken into custody but all were later released. Uber withdrew its taxi and van services in Hong Kong from 5th September 2016 to focus on its "core-business" car sharing services UberX and UberBlack which are used by the vast majority of passengers and drivers. Mainland IT company Tencent and Easy Taxi, which teamed up to launch a taxi booking service via smartphone app WeChat in Singapore in December 2013 are believed to be planning to roll the service out in Hong Kong. In July 2014 the Government's Legislative Council transport panel was informed that the police and Transport Department are monitoring the legality of taxi services provided through the growing use of smartphone apps. Alibaba's Kuaidi Taxi app, the most popular taxi app on the Chinese mainland, was launched in Hong Kong in August 2014 using regular metered fares but with an opening offer of a HK$20 rebate for all hirers collected through HSBC or Hang Seng Bank transfers or in cash from centres in Mong Kok, Kwai Chung and Causeway Bay. The app initially, however, is only available in simplified Chinese. Kuaidi also offers a customer loyalty scheme allowing passengers to accumulate points for each ride which can be redeemed for a small cup of coffee at Pacific Coffee. Other mobile apps which provide platforms for taxi drivers include HKTaxi and GoGo Taxi. By mid-2016 there were about 20 taxi apps available in the iTunes App Store including the first taxi industry-organised app "TAXI", introduced by the Taxi Council in May 2016. The app, intended to improve service quality and compete better with rival taxi services such as Uber, refers customers to drivers endorsed by the council, who must sign up to a "performance pledge", and includes a complaint system with complaints being followed up within 48 hours of being filed. At the time of its launch about 800 drivers were registered as endorsed with a further 700 endorsed drivers and 3,500 independent drivers expected to be registered under the app within a month. The Government's Public Transport Study (PTS) commenced a review into taxi services in mid-2015 and is expected consider the possibility of introducing premium taxi services and promoting "hire as a whole" taxi services, for which provision is already made under the Road Traffic Act, as an alternative option to charging by the meter. See paragraph "HIRING A TAXI AS A WHOLE" below for more information. The whole PTS is expected to take about two years to complete but priority is to be given to studying taxi and car hire services. In the meantime, in order to compete better with Uber, a coalition of over half of Hong Kong's taxi drivers and 17 industry groups which own over half of the taxi fleet launched a smartphone app in the spring of 2016 on a pilot basis, initially offering 500 taxis with the aim to extend the service to 1,000 taxis by the end of 2016. Proposals in mid-2016 by the Transport Department to offer three premium taxi operating franchises, each for 200 taxis under a trial franchise scheme lasting five years met with resistance from the Hong Kong Taxi Owners Association but the regulatory requirements were approved in April 2019.Franchisees will be required to make a substantial investment of at least HK$50 million to meet regulatory requirements including using newer vehicles, accepting electronic payments and providing compulsory customer service and safety training for drivers. The taxis will operate throughout Hong Kong in areas currently served by urban taxis and operators will be able to charge higher fares than existing metered rates. The franchises will be non-transferable and non-renewable. In September 2016 a newly formed taxi group representing owners of about 5,000 taxis, The Association of Taxi Industry Development, equipped 10 taxis with CCTV for a trial period in order to improve service quality and address complaints about poor conduct by some taxi drivers including refusing passengers, overcharging and taking unnecessarily long routes. Each taxi costs about HK$2,000 to equip. The association considered the trial a success and the intention is that all new taxis operated by the association's members will be equipped with cameras and that about 2,000 taxis will be equipped within a year. It is hoped that the government may eventually legislate to make CCTV compulsory in all taxis. Data, which is encrypted and can only be accessed with the consent of the association, is held confidentially for one month before being destroyed. The data will be accessed when requested by the police or for investigations or at the request of passengers subject to an administration fee of HK$300 plus the compensation equal to the hourly pay of the taxi driver. In February 2016 the same association launched a courtesy campaign by encouraging drivers to say at least two greetings such as "good morning" to passengers on each trip and installing a device for passengers to rate driver performance as "satisfactory", "average" or "unsatisfactory" to the back of the front passenger seat of 200 taxis. The rating is transmitted via GPS to the operator's control centre. In July 2018 the Transport Department announced it was introducing heavier penalties and a demerit point scheme improve standards and to discourage taxi drivers from overcharging, refusing hires and other bad practices. The current maximum fine of HK$10000 and six months in jail for first time offenders will be retained but repeat offenders but repeat offenders can be fined a maximum of HK$25000 and one year in jail for overcharging, refusing to accept a hire, failing to take the most direct route, soliciting and altering or defacing taxi meters. Demerit points will be issued for a range of eleven offences with offenders accumulating 15 points in two years facing suspension of licence for three months or six months for repeat offenders. HK$24 for the first 2kms then HK$1.7 each 200-metres until the fare reaches HK$83.5 (up to 9km), then HK$1.2 each 200-metres from HK$83.5 upwards (journeys over 9km). HK$20.5 for first 2kms then HK$1.5 each 200-metres until the fare reaches HK$65.5 (up to 8km), then HK$1.2 each 200-metres from HK$65.5 upwards. Waiting time HK$1.5 per minute up to fare HK$65.5 then HK$1.2 from HK$65.5 upwards. HK$19 for the first 2 kms then HK$1.5 each 200-metres until the fare reaches HK$154 (up to 20km), then HK$1.4 each 200-metres from HK$154 upwards (journeys over 20km). Waiting time is HK$1.5 per minute up to fare of HK$132 then HK$1.4 from HK$132 upwards. 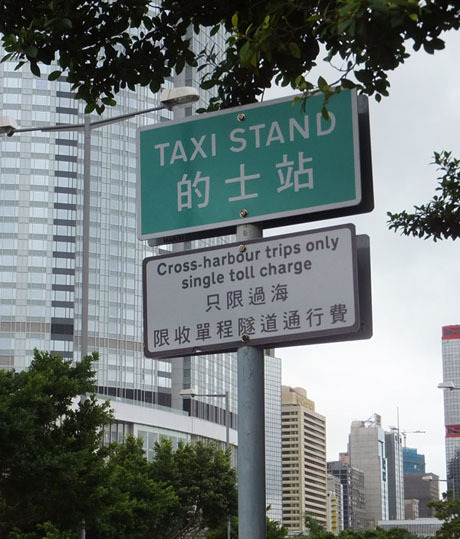 There are extra charges where the journey uses a cross- harbour tunnel, usually the return toll plus a surcharge (except that if the journey starts starts from a cross-harbour taxi stand only the single toll is charged -see below) or other tunnels or toll roads. The fare element for using the Lantau Link is HK$30. There are no extra charges for night time journeys or for extra passengers. * Under Road Traffic Regulations light personal hand baggage (including light suitcases, hat boxes, attache cases and similar articles) carried inside the passenger compartment of a taxi and wheelchairs and crutches carried by a disabled person who is a taxi passenger are not subject to the luggage surcharge. The size of "light personal hand luggage carried inside the passenger compartment" is not defined in the regulations. However, having regard to the views of the taxi trade and passengers, and the need to facilitate the daily operation of taxis (including preventing passengers from placing large pieces of baggage inside the passenger compartment so as to reduce the possibility of obstructing the driver's sightline, affecting the driving safety and causing damage to the compartment facilities, etc. ), the Transport Department has introduced some reference guidelines, stipulating that a piece of light hand luggage may be placed inside the passenger compartment and carried free of charge if its total dimensions (the sum of the length, width and height) do not exceed 140 cm meaning a taxi driver may charge a luggage surcharge of HK$6 on each piece of baggage which is placed inside the passenger compartment and has the total dimensions (the sum of the length, width and height) exceeding 140 cm, or on each piece of luggage of any dimensions which is placed inside the luggage compartment. Regulation 38 of Hong Kong's Road Traffic Act (Public Service Vehicles) Regulations makes provision for a taxi owner to hire out a taxi as a whole, effectively allowing a taxi owner to bargain for business rather than charge by the meter. The rate of hire can be based on time during which the taxi is hired or any other terms agreed between owner and hirer. To comply with this regulation both parties must sign two copies of a document stating charges agreed, third party insurance details in respect of the taxi and names, addresses and driving licence numbers of the taxi driver/s. Each party must retain one copy of the document, which may be produced to a police officer, on demand, at any time during the hire, and in the case of the taxi owner, for up to three months after commencement of the hire.